I love it when an older item gets new life: when, just as you’ve forgotten it at the back of your closet or reserved it for a specific season, you suddenly see it in a whole new light and the possibilities for it seem endless. I’m kicking off the weekend in these booties which have definitely gotten that fresh boost: they’ve been a fall/winter staple for a couple of years now, but when I tried them on with this dress, I ended up loving the way they offset the girlishness of the piece. Happy Friday and I hope you have a restful weekend! Love this! That pop of color is beautiful! Patterns, bright colors… this is my kind of outfit! Great mix of colors and prints. The Pashli is great pop of color, so cheery! such a cute dress! and that bag just brightens up the whole place! love it. Beautiful dress, the jacket looks so great with it. gorgeous dress! love it paired with the booties! I need that bag in my life, such a stunning piece! You look great, love your outfit. 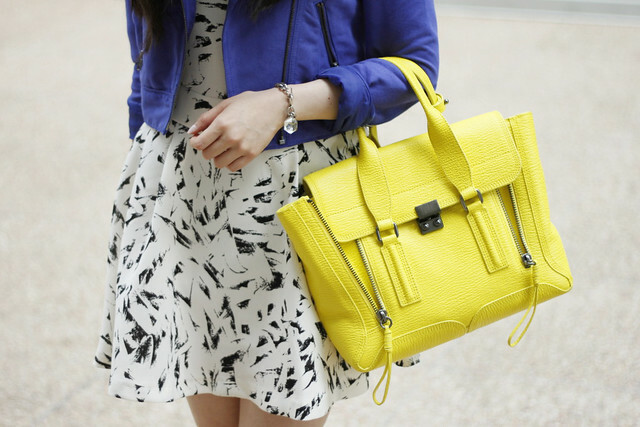 love this blue and yellow combo! too cute love! The boots add the perfect amount of edge, love it! And I still can’t get over that bag! Happy Friday! I love when you toughen up your looks. You’ve got the polished look down to a science, but it’s thrilled when you edge things up. Love it, Jen! And super crushing on that dress of yours, too. those shoes are great with that dress! i totally agree with the edginess that it give the outfit! I absolutely love how you styled your dress with your boots (yay for finding old stuff) and your jacket! I still love that bag! Love the yellow and blue. Cute dress! Love the yellow and blue together!